Home > Customer Reviews > Above and Beyond! We have purchased many vehicles and by far this was the best and quickest vehicle buying experience we’ve ever had! Diana went above and beyond our expectations. She was extremely knowledgeable and was a pleasure to work with. Outstanding hospitality. Made sure we were satisfied, understood the process, and made everything easy. Very friendly to LEO and Vincent has a great sense of humor! Most Fun You Can Have Buying a Car! I am pushing closer to 40 than I'd like to admit. With that being said, I have financed a lot of vehicles! This was hands down the easiest, most straightforward, and most fun I've EVER had buying a car. I called, we texted, I filled out an online application, expressed my goals, and now I own a truck! That was the buying part. The other part is the wonderful human, Vincent De La Rosa, that I got the pleasure of working with. He is now my forever car sales friend. He is true and honest. He was attentive to my particular requests and funny to boot. This was a fantastic experience and I love my beautiful used truck. Diana Franceschi was very helpful and knowledgeable about my vehicle. She worked hard and got the best deal possible. 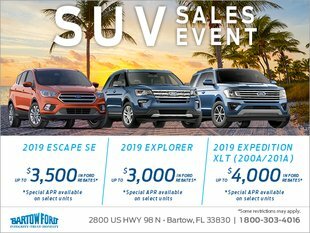 I recommend anyone looking for a new vehicle go see her at Bartow Ford.